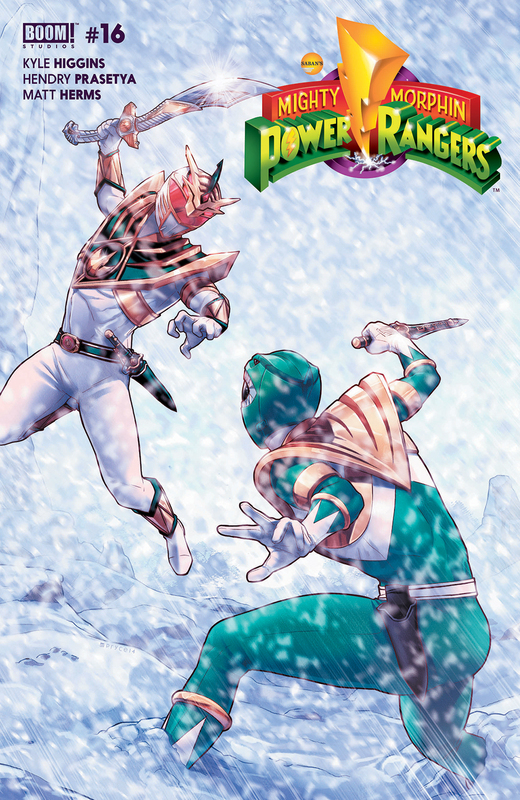 The fate of two worlds is on the line as the fight against Lord Drakkon reaches its epic climax in this week’s issue of Mighty Morphin Power Rangers. The wait is finally over, as the story that’s been building since the first issue of BOOM’s Mighty Morphin Power Rangers comes to a close with issue 16. We last saw the Rangers in issue 14 as Jason, Zack, Trini and Kim were fighting against a new army of Goldar clones, and Billy and Tommy came face-to-face with Lord Drakkon in the alternate universe. Faced with two impossible situations, both sets of Rangers get the chance to use their heads instead of their fists as they turn the tables with some hacking skills and creative manipulation of the Morphin Grid. The Rangers get their powers back, and Tommy finally gets to go one on one with his evil older self. Beneath all the clashing daggers and the post-apocalyptic warfare is the main message of Mighty Morphin Power Rangers, both the show and the comic, the idea that the only way to get through the hardest times is side-by-side with your friends. Lord Drakkon rejected his friends and nearly ended the world, and the only way to save it is for Tommy to reunite with his. In true Power Rangers fashion, in all its unsubtle glory, this message is outright stated by Tommy at the end of the issue. This is the strength of the MMPR comic, the idea that you can update the original show for an older audience without having to tone down the optimism. The Lord Drakkon arc has been a refutation of the tenants of “grimdark” media that’s been in vogue for the last few years. The alternate universe is one with older characters, drab colors, and more violence. It isn’t hard to imagine a jaded movie executive pitching that story for a reboot of the franchise at some point in time. Thankfully, Power Rangers has largely proven resilient to this trend. Seeing Higgins and Prasetya put the characters we know and love directly up against this idea has been a wonderful treat, and I look forward to next month.